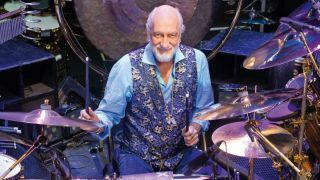 As he celebrated a whopping 50 years with Fleetwood Mac, 2018 saw Mick Fleetwood enjoy some time to sit back and reflect. But even while looking back to the past, the workaholic Fleetwood didn’t sat still for too long. That much is demonstrated in the brand new book, Love That Burns - A Chronicle of Fleetwood Mac: Volume One 1967-1974. A lot of people think that I formed Fleetwood Mac back then, they don’t realise that it wasn’t me. The limited-edition coffee table book has been produced by publisher Genesis and, as its name suggests, looks back at the early part of the iconic band’s career. With Fleetwood in reflective mood, what better time than to sit him behind our kit and put some key questions to him? “The book came about from a rather long journey, I’d imagine it has taken about 20 years. About 20 years ago George Harrison showed me a beautiful book that he was, I believe, working on at that time. It turned out that it was a Genesis Publications book. "I thought one day it would be good to put together a book like that. Over the years, I have seen so many beautiful books that Genesis have done over the years. They are stunning pieces of work, I consider them to be works of art in their own right. About two-and-a-half years ago, I was in Los Angeles and I picked up a book in a shop and it was a Led Zeppelin book and yet again it was a Genesis book. "I looked in the sleeve and had the idea to just call them and see if they wanted to do a book on the original Fleetwood Mac. It wasn’t planned, but the book tied in with the 50th anniversary of the original band. "A lot of people think that I formed Fleetwood Mac back then, they don’t realise that it wasn’t me, I was there right beside Peter Green and we put the band together. Without Peter Green there would be no Fleetwood Mac, and that is almost unthinkable. It is important that this part of Fleetwood Mac’s history should survive. What are your memories of your earliest days as a drummer, and also as a member of Fleetwood Mac? Who were your early musical heroes? What is the one piece of drum gear that you couldn’t live without? “I can’t confess that I have my original snare drum that I have been playing for 40 years. I don’t tend to hang onto things like that. I remember back in the day when we didn’t have any money, I would hang onto things. “On a personal level, and this is something that is told in this book, I had parents who were fully encouraging of this crazy young chap who wanted to play music. I wasn’t very good at school and one they got used to the idea that I wasn’t going to make it to college, they totally got into supporting this pipe dream of what I wanted to do. "The thing that I am very proud of is the fact that I managed to do what I set out to do. That was a goal that was fairly obscure and unbelievable, even for my parents, at the start. They couldn’t have really known back then that it would work out. I’m proud that I had that in my make-up and that I managed to make it work. 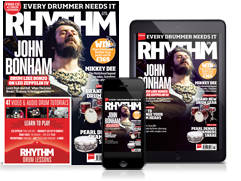 What is the key to longevity as a drummer? “I love what I am doing. I can’t really do anything else! Maybe that has turned out to be a reason why I have just kept on doing what I am doing. But I love it, it has taken me through my life. "There have been ups and downs during that passage of time, but always behind it was this backdrop of being in this band called Fleetwood Mac. I can’t complain about anything at all. This is my childhood dream and 50 years later I am still doing it. We’re still doing it and planning to go out next year and do a big old tour and get back at it. The band is still playing great as well. "As a drummer, you can’t do the show if you’re not physically able to. It was gratifying that I am able to pay attention to keeping myself fairly fit and fit enough to play the shows. There’s no reason, unless something goes physically, there is no reason why we can’t keep on doing this. “I am aware of the life that I have and I am very grateful for that. I have made a good living out of doing this and it has been a super interesting life. Yes, there have been some bad choices in terms of lifestyle choices, but generally I have no regrets at all. There were many moments in the putting together of this book that were thought-provoking. "Not all of those memories were happy, but most were a celebration of the camaraderie of that early band and the desire for us all to get in the trenches and go what we all loved doing. I consider myself extremely lucky. Did you take drum lessons early on? “No, I didn’t take any drum lessons - can’t you tell [laughs]? I was not a good pupil in any shape or form. I listened like a hawk to music and that helped me a great deal. I would do my own version of things that my influences were doing. I would just do my best to follow what they were doing. "Of course, half the time I was unable to get near to what they were doing. Tony Meehan, for instance, was a very accomplished player who obviously read music and all of that stuff and he had this touch as well.